Our complete guide covers everything there is to know about fishless cycling an aquarium. We discuss all of the strategies, pros, and cons related to the fishless cycle and why it is better than the traditional cycle. Cycling an aquarium is extremely important. It helps to establish healthy bacteria levels in the substrate and tank water. Many aquarium owners thing the only way to cycle a tank is with hardy fish. In reality, cycling is possible with or without fish present in the tank. For reasons discussed below, fishless cycling is highly recommended. There are several ways in which you can do this. However, using pure ammonia is often regarded as the best way to cycle a tank. In the article, we will discuss exactly how to fishless cycle with ammonia in a safe and effective manner. Cycling raises ammonia and nitrite to dangerous levels in a tank. If using live fish for the cycle, owners should stock their tank with hardy fish. Hardy fish help promote bacteria growth through waste production. Owners often replace them with the more desired fish once the cycle is completed. Often times, the hardy fish die as Ammonia and Nitrite levels rise. If the fish are lucky enough to survive the cycle, aquarium owners usually send them back to the fish store or trade them for more desirable fish. For these reason, using live fish for the cycle is not recommended. Fishless cycling is much more humane, as sacrificial fish are not required. In addition, cycling with live fish can take longer than fishless cycling. This is because since different fish produce diverse levels of waste. It is important to have your tank completely set up prior to cycling. At the core, this will include the tank and filtration. However, this can include lights, heaters, skimmers, and other such items. Do not attempt to use test strips for your cycle. Test strips are often inaccurate and provide wrong readings, especially when levels are high. In addition, you will need ammonia with no additives. I can’t stress that part enough. Most bottles of ammonia available for purchase contain types of soaps, perfumes, or scents. Make sure the ammonia is completely unscented and does not contain and surfacants. I would recommend using Dr. Tims Aquatics Ammonia Chloride. It is made specifically for use in fishless cycling aquariums. You can do a simple shake test to see if your ammonia is suitable for aquarium use. If the bubble go away instantly after shaken, the ammonia is fine to use. If the ammonia is “sudsy” and bubbles up for more than a few seconds, it contains surfactants. The main waste product in an aquarium is ammonia. As fish defecate, food decays, and waste builds, ammonia and nitrite levels increase. This becomes extremely toxic for tank inhabitants. Cycling a fish tank builds up the beneficial bacteria that convert these toxins to less harmful substances. Ideally, ammonia and nitrite levels should measure 0 ppm. Treat the water for chlorine prior to starting the cycling process. Chlorine will kill off the bacteria cultures created by cycling, which hinders the cycle process. Do not treat the water with any other chemicals once dechlorinated. This may sound strange, but bacteria are vital to the health of any aquarium. As ammonia rises, ammonia-oxidizer bacteria grow. This bacterium transforms ammonia into nitrites. However, high nitrite levels are toxic to fish as well. Nitrite-oxidizer bacteria then convert this into nitrate, which is way less toxic to fish and corals. As ammonia and nitrite drop, owners should expect nitrate levels to rise. High levels of ammonia are key to spurring the growth of beneficial bacteria colonies. Unfortunately, high ammonia levels can kill off other aquatic life in your tank. Sadly, establishing nitrite-oxidizer bacteria takes time. These colonies are often slow growing and take 30-45 days to mature. Be careful when adding ammonia sources. Once the bacteria begins to grow, ammonia should never go over 5 ppm. Excess levels of ammonia during the cycle can stall the process. “Seeding a tank” refers to using supplies from other established tanks to jumpstart the population of beneficial bacteria. These include items like gravel, decorations, driftwood, or filter media. Though this will not instantly bring ammonia and nitrite levels to 0 ppm, it can speed up the bacterial growth period dramatically. I would highly recommend trying to get a nice dirty filter pad or a few cups or gravel from a local fish store or a friend. In my experience, these work the best. It may seem counterproductive to add a “dirty” filter pad to your sparkling new tank, but it is necessary for the health of your future fish. How Does a Fishless Cycle Work? Fishless cycling and aquarium is relatively easy. After setting up a new tank, owners simply need to add an ammonia source. As the ammonia spikes, ammonia consuming bacteria grow. These bacteria convert the “extremely toxic” ammonia into “moderately toxic” nitrite. As nitrite spikes, nitrite consuming bacteria converts the “moderately toxic” nitrite into “mildly toxic” nitrate. Though their is only a once letter difference between nitrite and nitrate, there is a huge difference in toxicity. Once levels of ammonia and nitrite are 0, a large water change is required to reduce nitrate levels. Finally, it is safe to add fish! Continue water testing to check for ammonia and nitrite levels. Depending on the method used, this can take anywhere from one week to 45 days. This may seem like a long time for those eager to add fish, but it is extremely important. Low ammonia and nitrite levels are vital to fish longevity. Once the tank is up, there are four overall stages to fishless cycling. These stages may vary depending on the method of cycling used. Testing the water will show ammonia is now present. As ammonia increases, nitrite should begin to grow. These first low levels may not appear when tested. Testing the water should now provide ammonia and nitrite results. Readings for nitrate may not yet appear. Nitrate readings indicate growth of the desired bacteria. Nitrate levels should now show up when testing the water. When cycling is complete, ammonia and nitrite levels should read 0 ppm and nitrate levels will be high. A water change is required to remove nitrate. 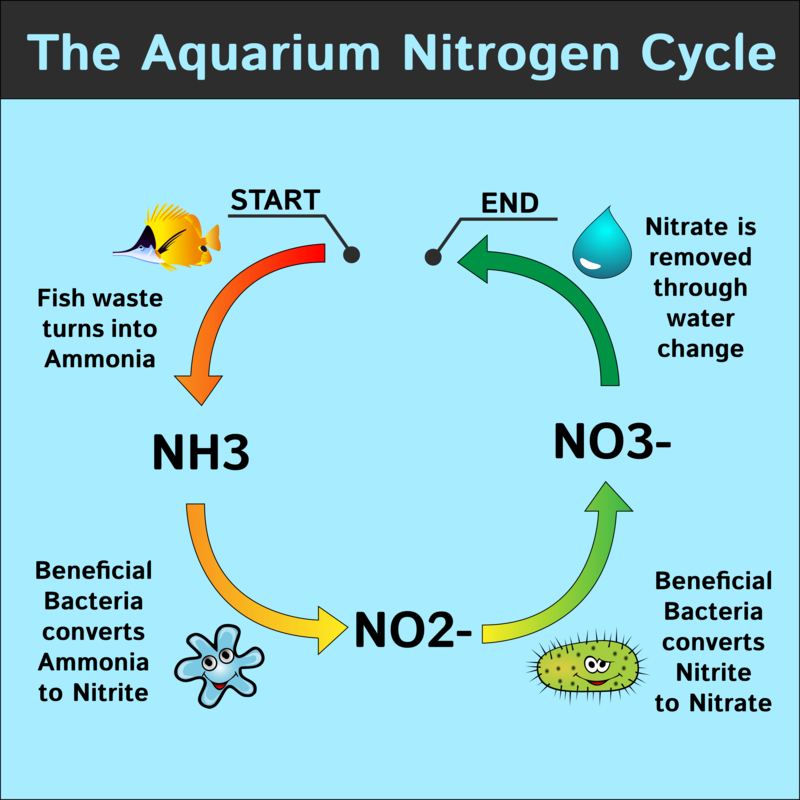 The best way to fishless cycle is with pure ammonia. This method provides a more exact cycling process and allows for the controlled introduction of ammonia to the tank. Moreover, it will support a large fish population once complete. When using this approach, owners will need an eyedropper as well. Before starting the cycle, make sure the entire tank is set up. This includes filters, substrates, rocks, decorations, etc. The most important of these are the filter and substrate, as these are where a lot of the beneficial bacteria grow. In addition, you should determine exactly how much ammonia you will need to add to your tank. Fill up a five gallon bucket with saltwater, add a few drops of ammonia, and mix well. Test the water and read the ammonia levels. Keep adding ammonia until levels reach 5ppm. You now have the direct ammonia per gallon ratio. Multiple this by how many 5 gallon buckets it would take to fill the tank. This will provide a precise number of drops needed for the tank. Record how many drops it took to reach 5ppm and save for future use. Measure ammonia and nitrite levels every 2 to 3 days. Once nitrite levels start to show, the cycle process has begun. This indicates that the ammonia-oxidizers have started working. At this point, owners should decrease ammonia additions. The ammonia should reduce to half the initial amount. Continue to measure ammonia and nitrite levels every 2 to 3 days. If not seeding the tank prior to cycling, the first phase can take 9 to 12 days. Again, pay attention to the ammonia levels. Levels over 5 ppm can poison the nitrite-oxidizer bacteria. Destroying this colony of bacteria will prolong the cycling process. As before, continue to test the ammonia and nitrite every 2 to 3 days. When the nitrite levels being to drop, expect a rapid decrease. This is the start of the final phase. As the nitrite levels decrease, the nitrate reading will increase. When the ammonia and nitrite levels reach 0 ppm, the cycle is almost done. Administer one final test before adding fish. Add a full dose of ammonia to the water to bring it to 4ppm. Allow it to sit overnight. When tested the next day, only nitrate should appear. Ammonia and Nitrite levels should read 0ppm. If the ammonia or nitrite level is over 0 ppm, cycling is not complete. Continue to cycle and test the water. Perform this test again when the fishless cycle appears done. If this test is sucessfully completely, you are a single water change away from adding fish! Since no type of bacteria feeds on nitrate, you will need to perform a large water change to get the levels down. I would recommend doing a 60-70% water change, then test to make sure nitrate is below 20ppm. Unless adding fish shortly after cycling, add small doses of ammonia. This will continue to feed the nitrite-oxidizer bacteria. Stop only when adding the fish. The fish will produce the necessary waste to grow the bacteria. Seeding the tank can reduce this approach to a mere 7 days to completion. Without seeding, this method can take about 3 weeks. Whether seeding or not, this method of fishless cycling is still the fastest and most accurate. In addition, cycling an aquarium with ammonia supports a very well-stocked fish tank. Compared to organic matter, pure ammonia will not cloud the water or emit an odor. It does not clutter the tank with unattractive decaying material either. Pure ammonia is not available in all areas. The use of online shopping can help with this. Make sure you read the ingredient list before adding any type of ammonia to your tank. Introducing additives may delay the cycling process. The cheapest fishless cycling method is with fish food. After setting up the tank, owners simply add a few pinches of fish food. An exact formula for how much fish food to add does not exist. However, fish flakes work better than the pellet versions. They break down faster and, therefore, produce ammonia quicker. Spread the fish food evenly over the surface of the water. Base the quantity on personal judgment. Since there are no live fish in the tank, overdoing will not really harm anything. As it sinks and decays, the fish food releases ammonia. When using organic matter to cycle a tank, owners should test the water every day. Be sure to check the ammonia and nitrite levels. If they are not at zero, add more food and continue to cycle. This way will take a minimum of 45 days for brand new tanks with no seeding material. Please be aware that it can take longer due to the composition of fish food. Another means of organic fishless cycling is to add dead shrimp. To do this, purchase shrimp from a local grocery store. At home, chop the shrimp into chunks and add them to the fish tank. As with the fish food, when the shrimp decays, it releases ammonia. Similarly, owners can use dead fish from the grocery store instead of shrimp. After adding the shrimp/fish food, continue on like you would with the ammonia method. This method usually takes longer, as you have to wait for the organic material to decompose and produce ammonia. In addition, this method produces cloudy water and a lot of odor. As stated before, fish food is the cheapest way to cycle. For those on a budget, this may be the most affordable method. The dead shrimp method also works. It provides more ammonia than the fish food method. This is because of the fully organic composition. The shrimp method works faster than the fish food as well. This means of fishless cycling should support small quantities of fish once done. Using fish food is the slowest means of cycling. Fish food often does not contain enough organic material to work quickly. It often leaves food debris floating around the bottom of the tank as well. This can trigger other types of bacteria to grow. This method will not support a large bio-load once the cycle is complete. The dead shrimp method is not very exact. Owners do not have a real grasp of how much to add or remove per gallon. It can cause large ammonia spikes that are detrimental to bacteria. Furthermore, rotting shrimp is not attractive and can create odors. Decaying shrimp can also cause bacteria blooms that may cloud the water. As with the fish food, ammonia and nitrites may spike after adding live fish. It is extremely important for tank owners to cycle their tank properly. High ammonia and nitrite levels can and will kill fish. Fishless cycling provides water adjustments without harming living fish. It is the most humane way cycle aquariums and prepare a tank for use. Using pure ammonia to grow nitrite-oxidizer bacteria works very well. It is a safe means of creating a colony that will to absorb fish waste. Ammonia is unavoidable in the beginning. By taking the time to grow beneficial bacteria colonies, ammonia levels will stay low. Based on my experience, I would highly suggest going the pure ammonia route when cycling a new aquarium. It takes a little more testing and work, but the ammonia method provides quality results and control over bacteria growth. In the end, you will be glad you went with the ammonia cycle approach.